I am very pleased with the outcome of my polar bear totem. Using blue ink instead of black helped to give the bear that “icy” look. I was very free spirited (see what I did there) in my approach to the designs on this one. The back section looks like bear claws to me. At first, this was unintentional but then I just went with it. Blue is one of my favorite colors (and also green) so I always enjoy playing around with the values and different hues of the color. I remember in high school drawing a green giraffe and I loved getting the different shadows using the same shade of color. I felt the same joy when creating this piece. I have more ideas for single color drawings that I will be playing with in the near future. Now, on to some polar bear symbolism! Bear claws? Icicles? What do you think? What a powerful totem the polar bear is! They are the largest land carnivore and quite possibly the toughest. Polar bears are solitary animals. They hunt alone, live alone and come together only to mate. They survive one of the harshest environments on Earth and they do it with their own willpower and independence. This is their first lesson. Stand on your own two feet. If polar bear has presented itself to you, it may be time to become more self- reliant. You have the power to make it on your own. You have the capability to get through any hardship, no matter how big, without the hand of someone else to pull you out. Find your own strength and pull yourself out! Polar Bears are so impressive that the Inuit have a great respect for them and their mythology has many tales to honor the polar bear. It was believed that the polar bear was a god and the master of all bears. He could walk on two legs like a man, he was immense in size and so, his soul was just as immense. He protected the other bears and would watch the hunters to ensure they respected the bears they had hunted, with a special ceremony, and to also use every part of the creature. This great respect was appreciated by the polar bear god and in return he would ensure the hunter’s success on the next hunt. The polar bear, however, is a target for no one. They have terrific camouflage, blending right into the environment. They “disappear” right before your eyes. They are the masters of cloaking themselves. Perhaps you should be doing the same. It is always important to stand out and be unique but the polar bear could be telling you right now is a good time to blend into the background. Become unseen and step back. Observe what is happening around you, quietly and patiently. Only when you have a full understanding of everything around you, can you emerge with an incredible power that no one saw coming. It is okay to take time to collect ourselves, understanding ourselves and our environment. This will ensure success in our own hunts! Polar bears are also a strong symbol for mothering and preparing for new life. The only time a polar bear will hibernate is when a female gives birth to cubs. Polar bears are fierce and protective mothers. The cubs stay with their mother for around two years until she has taught them everything they need to know about surviving on their own. This could be a sign telling you to start preparing for a cub of your own. Or perhaps you have a new project or responsibility that needs your utmost care and devotion to see it to completion. The polar bear has much to teach us and should be greatly respected as a powerful guide and totem. What do you think the polar is saying to you? Share your story in the comments below! Thanks for stopping by this week and I hope you enjoyed my latest totem drawing. Check back next week for a unique post about animal symbolism. This one will be like none I have created before! I had so much fun making this one. With each piece that I do it becomes easier and easier for me to “let loose”. I have always set up “rules” for myself, forcing myself to stick to a made up guideline when it came to my drawings. Since working with zentangle and my totem animals though, I am feeling more like a free spirit than I ever have before and my work is better because of it! This piece was fluent. I have been wanting to do a polar bear for a while now but unintentionally waited until winter time to create it. I am still lacking in black ink since inktober happened and so I decided to go with blue. This is the first time I have used a color other than black for the outline and I think it came out pretty cool. I wonder what kind of affect I will get when I add the colored pencil. Although, I have to say, it looks good in the black too. What do you think? Should I experiment more with different color outlines or just stick with black? Share your thoughts in the comments below! Thanks for stopping by today! Check back later this week to learn about polar bear symbolism and to see the finished drawing! The bear is a common favorite as far as animals go. They are strong and dominant. They have such power that anyone would quiver with fear in the presence of one. At the same time, you just want to run up to him and give him a big ol’ woolly bear hug as you lovingly bury your face in his fur. You probably shouldn’t go around hugging bears though. 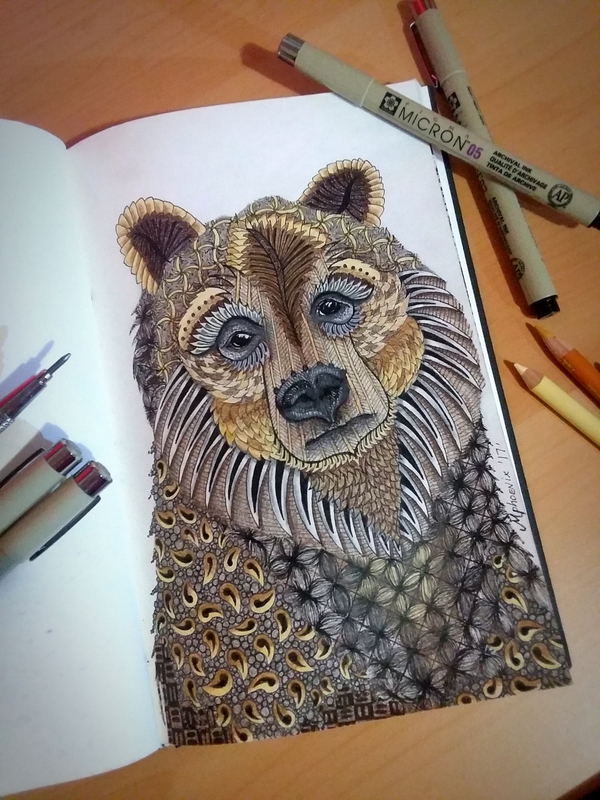 Instead, I decided to show my love by using the bear as the subject for my latest zentangle piece. I was excited to start it. Upon working on the piece, the fur became very distracting and I struggled with how to represent it. It came out quite busy. It’s busier than I usually go for but with each piece is a new learning experience. I am also dismayed with the colors. Unfortunately, I need to re-up on pencils so my color options were limited. I didn’t have the shades I would have preferred. Despite so much conflicting me with this drawing, it still came out pretty well. With such a contrasting highlight it makes the bear look like it has golden fur. Still, I will probably make a second attempt to see what else I may be able to put together. So what is bear’s message anyway? Bear tells us that we need to slow down and relax. Perhaps you feel as though you’re between a rock and a hard place. Circumstances have left you overwhelmed and not knowing what to do next. Bear says that you do know. It is now time to hibernate if you will. Go to your quiet place, close your eyes and go to the silence. Go to the dark. The Void. Your mind needs time to collect itself…yourself. You know all the answers to your problems, you’re just not listening to yourself. Stand firm and grounded, like bear, so you can act in confidence. Harness the raw power that you already possess. You know what path will lead you to happiness. Now just quiet yourself and listen! Like the bear who wakes in the spring from a long deep sleep, we too will awaken from our own sleep. A sleep that we created. A sleep that prevents us from knowing the know, ya know? Bear takes the time to enjoy the sweet honey in life. We should do the same and be greatful for how sweet life can be. It may seem simple but in a time when we feel like we have no time, we could all learn from bear. Thanks for stopping by this week! I hope you enjoyed my latest piece. Stay tuned for more totems. I have recently finished moose and have started working on raccoon. I wonder what lessons they have in store for us.